Lenders these days are pricing their mortgages according to the Loan to Value (LTV), in a way that previously made little difference. For example, a 60% LTV mortgage might be priced at 2%, a 70% LTV might be priced at 3%, and an 80% LTV mortgage might be priced at 4%. This offers the opportunity to strategically re-mortgage a property portfolio, to enable ‘excess’ equity in some properties to be used to lower the LTV of other properties, so that as much as possible of the total borrowings are at attractive interest rates. Gideon owns 5 mortgaged rental properties, on which he pays £36k of annual mortgage interest. Two of the properties are at 80% LTV, and 3 of the properties are at 47% LTV. Gideon is paying 4% interest on all of the mortgages. Note: Gideon could have saved himself £6.300 by simply re-mortgaging the 3 low-geared properties onto the 60%-LTV mortgage – but by not capital raising and using the ‘spare’ equity to pay down the mortgages on properties #4 and #5, he misses out on a further £7,200 of extra savings i.e. he would have had less than half the potential savings available. Sounds good – anything else to consider? Obviously, re-mortgaging property is not free of costs (legal fees, broker fees, etc) – BUT, ‘harmonising’ the mortgages on a property portfolio in this way can lead to substantial cost savings, which will repeat each year. Many lenders have ‘free legals & fees’ offers, to reduce the frictional costs of re-mortgaging, and many brokers will offer discounts on their fees if multiple properties are being re-mortgaged simultaneously. One other key benefit of this strategy is to avoid the new ‘Stress Test’ rates that many lenders have put in place recently (e.g. TMW now have a 145% Stress Test compared to their historic 125% Stress Test rate) – meaning that better mortgage interest rates can be achieved as a result of lowering the LTVs on the higher-geared (80%) properties. Of course, the key benefit of this ‘mortgage harmonisation’ strategy is in utilising ‘lazy’ equity to ensure that the total cost of borrowing across a portfolio is reduced – note that in the previous example, Gideon has not lowered his overall borrowings: he owed £900k in mortgages before and after the re-mortgaging. Gideon has simply been clever in his overall financing strategy. I’ve got some spare cash – is it worth paying down my mortgages with this? Pre-Section24, the answer was usually to buy more property, assuming after all costs the property produced a good ‘cash on cash’ return after all costs (and assuming all mortgage interest is fully tax-deductible!). However, with Section 24 in full force, there is now a much stronger case for repaying mortgages but only on a strategic way i.e. sprinkling limited cash funds across multiple mortgages is unlikely to produce an optimum result. For example, let’s say Gideon has a 7th property, and has already harmonised his mortgage borrowings across his 6 properties as we have previously seen. Gideon has some working capital for repairs and voids, but still has spare cash reserves. He is already affected by Section 24 and does not want to expand his portfolio further. In this way, the strategic use of cash to re-mortgage properties onto the best possible interest rate can be an excellent way to reduce costs and the impact of Section 24 where funds are limited. But what about my lovely tracker rate mortgages – I don’t want to lose them! For many landlords, their current mortgage rate couldn’t be improved by re-mortgaging, and so there is much less incentive to re-mortgage. For example, if a property is currently financed at 1.75%+Bank Rate (2.0% total), it is highly unlikely that a better long-term re-mortgage product could be obtained, and so there would be little incentive to re-mortgage. I underlined the words ‘long-term’ above because while there are some very low interest rates available currently (e.g. at May 2017, TMW have a 1.59% product), these are short-term fixed rates, which then usually revert onto the lender’s Standard Variable Rate (e.g. TMW;s SVR is 4.99% as at May 2017). Therefore, in many cases it would make more sense to stay with the current lender, as there may be 10+ years to run on the current attractive interest rate. In other words, be careful not to re-mortgage away from a good long-term rate in favour of a better short-term rate which then reverts to a worse rate after the initial fix ends. As Section 24 is being phased in over a 4 year period (tax years 2018, 2019, 2020, 2021), it generally makes sense – all things being equal – to incur higher arrangement fees at the start of the loan, and pay a lower interest rate, than vice versa. Arrangement fees can be offset against rental profits when incurred – and “incurred” means even if added to the mortgage balance. Lenders offer different mortgages which may have a high-fee low-interest rate, or a low-fee high-interest rate. When the numbers are crunched, there is often not much of a difference over (say) a 5-year period when comparing 5 years of interest plus the arrangement fee. By choosing to ‘incur’ more of the overall finance cost earlier, the % of the overall mortgage cost that is allowable for tax purposes will be higher (i.e. because only 25% of finance costs are disallowed when calculating ‘taxable income’ in 2018, whereas in tax year 2021, 100% of the finance cost is disallowed when calculating taxable income). What is the tax benefit of all this – is it really worth doing? The cashflow benefit alone of Gideon harmonising his 6 mortgages (see first example) was £13,500 per annum (a 38% reduction in mortgage interest costs) – which in itself is an excellent saving to make. Don’t forget that Section 24 is a tax on mortgage interest paid, and so landlords need to ensure that their equity and mortgage position is as harmonised possible, and that any opportunity to use spare cash strategically to obtain the best LTVs and mortgages have been taken. However, the tax benefit of harmonising mortgages to reduce mortgage interest payable is also significant for many landlords. The above shows that, as a result of re-mortgaging, Gideon’s after-tax cashflow has increased beyond the pre-Section 24 figure – and, remember, in this example Gideon has not actually lowered his overall mortgage borrowings. This means that by re-mortgaging strategically, Gideon has been able to mitigate the £9,900 tax increase by lowering his mortgage interest figure by £13,500. This of course won’t be possible in all cases, but it shows how powerful this ‘strategic re-mortgaging’ strategy can be. 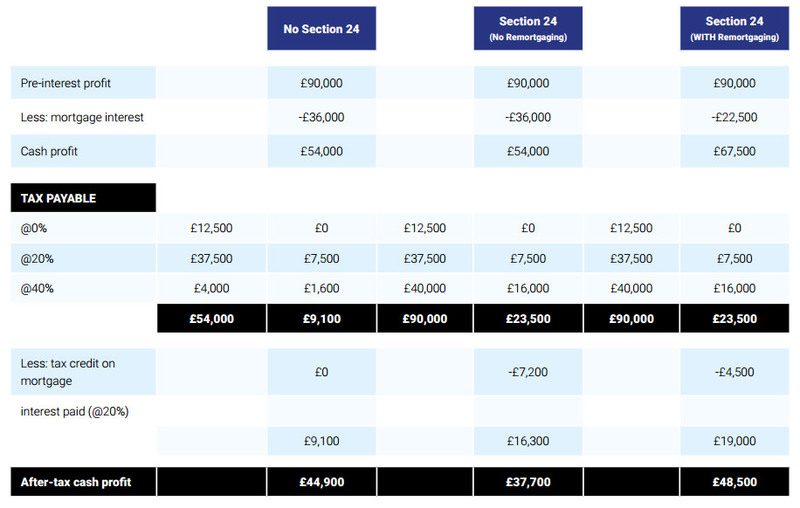 Many landlords are confused by Section 24, and wondering about the benefits of incorporation – but without having firstly looked at all the simple and relatively cheap options available to them – such as strategic re-mortgaging to reduce their mortgage interest payable to the lowest amount possible. However, a full strategic review of a portfolio’s borrowings could yield significant cashflow savings, due to lower interest payable and the tax impact of that – for many landlords, looking at this aspect of their property business could be the difference between surviving Section 24 … or not.